Laline Paull has written what may turn out to the “buzz book” of the late spring and summer. 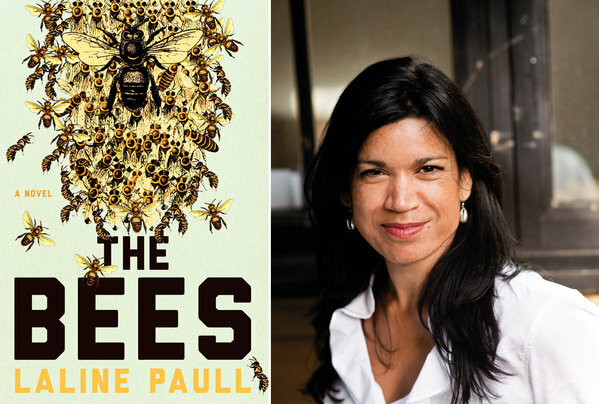 Inspired by the death of a beekeeper friend and fascinated by the world of honey bees, Paull engaged in an intense period of research and writing to produce her first novel after many years as a screenwriter and playwright. For those of us who grew up on Winnie the Pooh, The Wind in the Willows and, especially, the adult “animal fantasy” Watership Down, The Bees provides a rare kind of adventure, filled with intriguing characters, a mysterious world made comprehensible, and thrilling life-or-death stakes. The Bees is an intelligent and literary page-turner, the perfect book for the summer of 2014. You spent many years in the film business as a screenwriter and have also worked in the English theatre. What led you to write a novel, and why one about bees? I was always heading for the novel; I started my first one age seven. I wish there had been someone around to tell me about rewriting, because when it didn’t come out the way I meant (my family called it ‘sweet’ but it was supposed to be dark and dramatic) I assumed I couldn’t do it, and I remember being very upset because I really wanted to be a writer. What kind of research did you do in order to write so knowledgeably about bees and the world from their perspective? I have to say I’m no expert, nor a beekeeper (as yet) but I did read as much as I could – and good grief there’s a lot written. And I also talked to beekeepers and watched them work their hives, and I got a lot of help from the generous international community of bee biologists. They’re great people, they love to share. Other than the nature of bee society and the structure of a hive, what were your influences in crafting the physical and cultural world of the hive, which is such a captivating aspect of the novel? How much is based on fact and how much from your imagination? I cannot tell you how glad I am that the hive works – or how much work I did to get it right. I knew it was critical that the reader had a real sense of place, but that was the bit where I was scared, because it took a long time to get right. I went to the British Museum and hung out in the Minoan rooms, where there were floor-plans of palaces, and interestingly, very little about males. It was a 5th century BC female-oriented society, and I found that supportive to my aims. And I tried to find out about oil rigs, and cathedrals, and factories, and ultra-luxury hotels. And then I just had to go for it. I did one really messy sketch of the hive interior that obeyed logic, so I clung to that. Well, I loved Watership Down as a child, it was such a logical imaginative encounter for me. Of course animals had societies and feelings and characters – children don’t have any problem whatsoever with that. It’s only as we get older we repress that imaginative sympathy with the natural world – and look where it’s got us. Not that I’m a tree-hugger or think every ant has a star-sign. But to be mentioned in the same breath as Richard Adams is a huge compliment. I appreciated the fact that, along with animals and insects (“the Myriad”), threats to the bees also included human activities such as the use of pesticides. With the recent decimation of bee communities, the public is realizing how central they are to our food supply. What do you make of this situation and the claim that the use of neonicotinoids is killing off bees? The honeybee has become the secular symbol for a rising of environmental consciousness, though there are plenty of other pollinators also under threat. But because humans and honeybees have a very ancient tradition of honey-for-housing, we are starting to feel their pain as colonies world-wide are suffering. Is it neonicotinoids? There is a lot of evidence pointing that way. And a lot of people refuting it. I have my own opinion, and readers will know what it is. But that’s all it is – an opinion, from someone who’s written a book, but is no expert. Flora 717 is a compelling protagonist, humble and daring, smart and shrewd, rational and passionate. It is impossible not to root for her. How did she come about? Did you find that she evolved as you wrote the book? Flora was born in my imagination when I first learned about the one in ten thousand sterile worker bees who begin to form eggs in their bodies and lay. Every colony has them, and to deal with them, other bees will hunt them down and kill them. Biologists don’t know why certain bees will do this or other tasks – there is an order as yet opaque to science as to why bees do many things. So there is a criminal, and there are police. That’s a fact of hive life. And if your crime is to try to protect your child – you ask any mother how much she’ll care about the law then. Once Flora feels mother love, there’s no going back. And my story could take off. I was fascinated by Flora’s desperation to fulfill what she felt was her destiny, to be a mother, even if she wasn’t the Queen and thus was committing a capital offense. It gave the novel emotional heft. Flora’s motherhood is the mainspring of the novel – without it, it would just be a story of hive life. Which you’ll already know I find fascinating, but a novel needs a powerful driving force. Or at least, the ones l like reading do. When I started my research, I knew I had the territory for the book, but I didn’t have the narrative shape until the phenomenon of the laying worker became Flora 717. The Bees is very cinematic, with a wide range of characters, a fascinating setting, and a rigidly hierarchical society lending it great interest. It begs to be turned into a movie. Do you see it being done in CGI or more traditional animation? It makes me happy you see it that way too. With my background as a screenwriter, I’m trained to think in images and perhaps that’s why a lot of people believe The Bees has cinematic potential. And I really respect great story telling, and I tried to put everything I know about how stories work into this book. It gives the novel a strength in many forms. It’ll be exciting to see who comes forward. What was your reaction when you learned that Margaret Atwood, Emma Donoghue, and Madeline Miller had written blurbs for the book cover? That’s quite a trio. I was thrilled just to exchange a few tweets with Margaret Atwood last year. Oh, beyond thrilling. First it was Madeline Miller – forever special to me for being the first writer to publicly support this book. If you’re reading this Madeline: Thank you again! And then Emma Donoghue, whose book Room I was too scared to read for ages, but then when she blurbed me and was going to be in London to promote Frog Music, I read it and got to thank her in person. And she was great – did you know she’s a wonderful singer and performer, too? And as for the great, legendary, and brilliant Margaret Atwood – I was paying at a gas station and checked my phone when the tweet pinged – and then I just stood there staring at it in my hand, reading it again and again as if I was hallucinating. The cashiers stood watching me, and one of them looked really worried. He said, ‘Is everything alright?’ and I looked at him and I just said, ‘Margaret Atwood.’ And he looked at the other cashier and back at me and said, ‘Is that a good thing?’ And I said, ‘Better than I ever dared dream.’ So that gas station is now known in our family as The Margaret Atwood Garage. And I met her in London to thank her, after she gave a brilliant and witty lecture on translation at the British Library (in which she also sang – there’s something going on here). She was really nice and shook my hand and told me how much she enjoyed the book, and drew me a bee in her dedication of Maddadam. What a lady. Your work at Roundhouse Theatre with young people sounds fascinating. Can you describe the project and how/why you became involved? I’m impressed, you’ve done your homework. I started working at the Roundhouse because I saw a gang incident on the street, and because I’d recently been doing theatre workshops for my play Boat Memory at some very privileged schools, at first I thought it was a cast of kids, acting something out. But it wasn’t, it was a bad thing happening in real life on the street. So the next morning I called the Roundhouse and insisted I would come in and work for free, doing anything drama-related. And that quickly led to paid work, and it was incredibly rewarding. The best thing was the workshop that started out like a total disaster, but ended with the group of young men doing a mash-up of [Shakespeare’s] Sonnet 18 (‘Shall I compare thee to a summer’s day?’) with their own street patois, with French, with Arabic, with Jamaican dialect, then dancing it with their parkour moves. They were touched with genius that day and they felt it, too. I wish I’d filmed it. Do you have any plans to turn your plays “Eskimo Sisters,” “Radiance,” “Show and Tell,” and “Boat Memory” into novels or films? They all sound intriguing. Thank you. Definitely not Eskimo Sisters – that’s territory that’s been covered, but I was just today writing about Boat Memory for a British newspaper article, because it’s just such an amazing true story, and like The Bees, I was lucky enough to see the treasure poking through the facts, and make a play from it. I go on about Boat Memory to anyone who’ll listen, because those three kidnapped Patagonian kids are the trigger for Charles Darwin writing The Voyage of The Beagle, which led to The Origin of Species, which led to the massive religious and social furor over the theory of evolution versus Creationism. So though they were so valueless as to be traded for a canoe by Captain Fitzroy, they ended up being part of the overturning British society. Show and Tell still gets performed by youth groups, and I think Radiance has a lot of mileage as a film too – again, an amazing true story of the Second World War, but from an interesting social perspective. I’m always interested to know about a writer’s working life. Where do you do most of your writing? What is your routine (if you have one)? Who is/are your first reader(s)? And for the writers out there, how long did it take you to write The Bees? Tell us about the journey from conception to completion. I write in my beautiful shed, no phone, no internet, no visitors. My alarm clock starts my routine, but I’m a bit superstitious about saying more, in case things stop working. My first reader depends on what sort of piece it is. For The Bees, it was my brother, who was an English teacher at the time. And for writers out there, well, this was a very, very speedy book – I’m writing these interview answers on April 29, 2014, but a year ago I still didn’t have an agent. I wrote four or five drafts in fourteen months, and it was HARD. But worth it! And thanks for choosing The Bees to tell your readers about, and for supporting writers. A pleasure to answer your questions.